Triumph motorcycles, a modern British attitude comes up with it’s a new iconic classic cruiser Bonneville Speedmaster 2018. . The fun and accessible contemporary Bonneville gets a significant retrofit in capability and style to create this iconic classic cruiser. 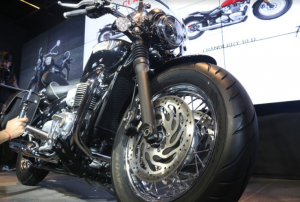 New speedmaster shares many similarities with Triumph bobber but with more practicalitiy . The new speedmaster , for the one who loved earlier versions of Bonneville or triumph bobber updated with a pillion seat. The new Bonneville Speedmaster takes Triumph’s critically acclaimed 1200cc High Torque parallel-twin engine delivering -leading peak torque of 106Nm at 4,000rpm. 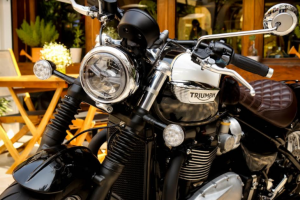 According to Triumph, the engine produces 10% more horsepower and torque than the Bonneville T120 at 4500 rpm. And familiar with the old 865cc Speedmaster, the new model and its larger engine claims a 25% increase in peak horsepower and 42% increase in maximum torque output of 77PS with six speed gearbox. The bright chromed stainless steel exhaust is twin skinned for a seamless hidden cat box run and finished with unique bright chrome silencers. It also has a twin air box with twin filter design. The chassis is similar to the Bobber’s, with a gloss black powder coated tubular steel twin cradle frame and a hard-tail look. 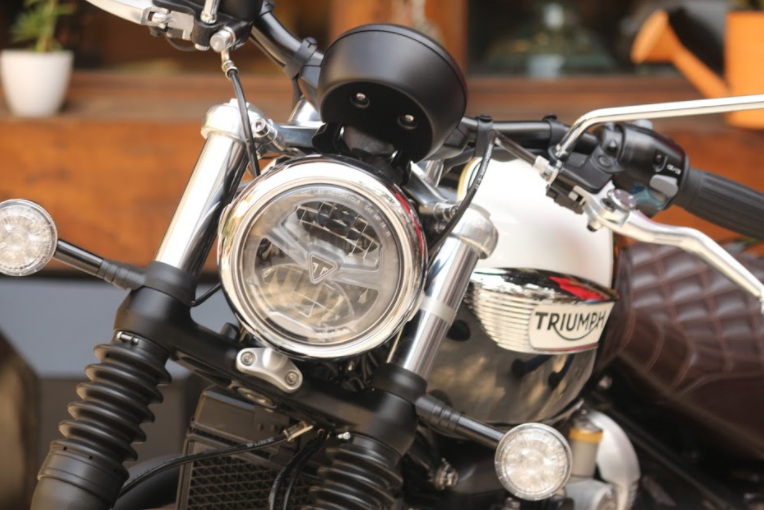 The Bonneville Speedmaster also has a larger 12-litre fuel tank for increased range and comes with easily interchangeable twin and single seat set ups for added versatility. Other features sums up with a 5” full-LED headlight with distinctive daytime running light pattern and full LED lighting throughout (rear light, indicators and number plate light). 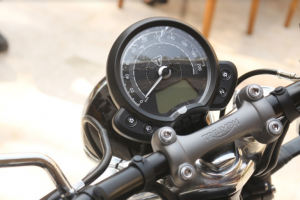 The new ride-by-wire throttle enables two riding modes (Road and Rain), plus it has the latest generation ABS and switchable traction control. The torque assist clutch, which helps prevent rider fatigue by reducing pull effort at the lever, along with the new single button cruise control, improve rideability and comfort. There is also a feature packed, yet stylishly minimal, single clock with analogue speedometer and LCD display, controlled by easy to reach fingertip controls . And the best part about the new speedmaster is the major first service interval of 16,000 kms (10,000 miles). The ‘Maverick’ kit gives the Speedmaster an even more stripped back, mean attitude with a brown quilted single seat set up, flatter raked out handlebars, black Vance & Hines exhausts and other blacked out details, including exhaust headers, oil filler cap, and a grab rail removal kit and rear mudguard finisher for a stylish and minimal rear end. Also a dedicated range for new speedmaster is added to hugely popular Bonneville clothing collection. The new Speedmaster range includes four stylish t-shirts, a casual quilted jacket, a monochrome checked riding shirt, and a trendy grey hoodie.